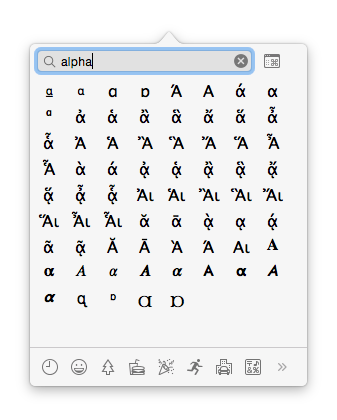 I can use ⌥ + S to type the greek letter ß (beta) in any application, which is very useful. However, what about poor α (alpha)? Is there a shortcut for it? Currently, I either copy & paste it from another source or switch the keyboard to greek temporarily. Both methods take a lot of time, and copy & paste often results in formatting problems as well (the source format is preserved). Is there a shortcut to quickly type alpha, or a way I can create it (through an app or messing with hidden system settings for example)? ß isn't beta. It's the (german) sharp s. The greek beta looks like this: β. To type α/β/γ/ε etc., you just have to switch the keyboard layout with ShiftAltSpacebar, hit A/B/G/E etc. and switch back to your common keyboard layout with ShiftAltSpacebar. If you have more than two keyboard layouts enabled (e.g. US, Greek, Hex) you may add a second keyboard shortcut "Select previous source in input menu" and hit that one to get back or you have to rotate through all your layouts with the "Select next source in input menu"-shortcut until you reach your common layout again. That's not actually beta, it's the German 'ess zett' s/z used for 'double s' in "heiß" (= hot) etc. - which is why it sits under s not b.
I'd use System Prefs > Keyboard > Text & add a replace shortcut. Create a shortcut text snippet. Go to System Preferences (from the Apple  menu). Click on Keyboard and then the Text tab. Enter “aalpha” (or another text of your choosing that you are unlikely to type by accident) under the “Replace” column and paste the alpha symbol α into the “With” column. Now whenever you type “aalpha” you will get α instead. Pretty cool. Hit Command-Ctrl-Space (⌘⌃-Space). A palette with emoji should show up. Type the name of the character or symbol you want in the search box at the top. (You may have to scroll up within the pallette). Click the symbol to use it. I use the Character Viewer to insert any Unicode character into my documents. 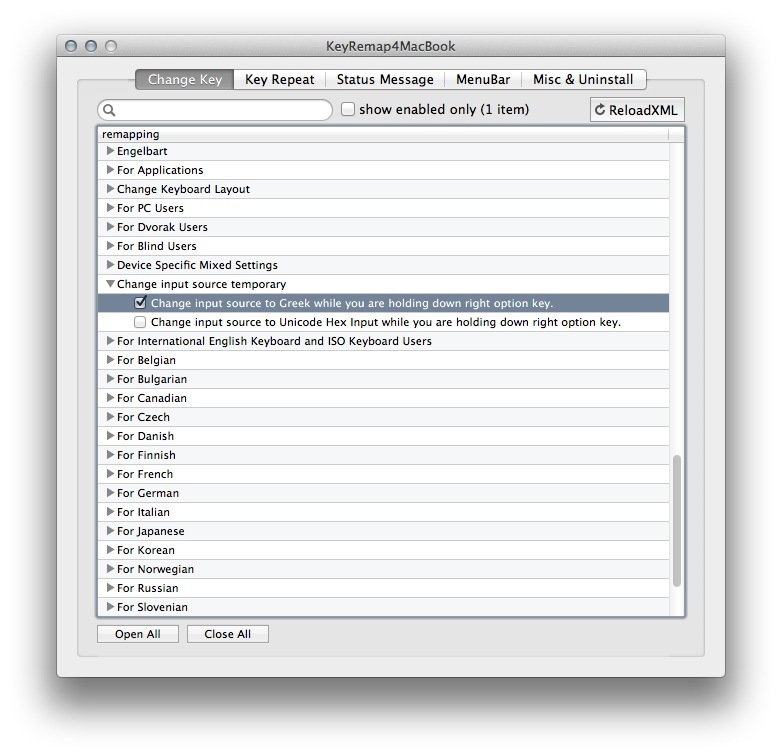 This can be enabled from the Keyboard Preferences menu. If you want to type Greek letters easily but without switching your keyboard layout, you can use a custom KeyBinding dictionary. This is mine; it allows me to type ⌃G, ⌃A to get the letter alpha, and similar for most other Greek letters, plus a bunch of other useful symbols. You can place it at ~/Library/KeyBindings/DefaultKeyBinding.dict. You can also see more details in my answer here. You can use Ukelele to create a new keyboard layout, which will be based on whatever you would like to have Greek letters in. Then, via this app, you can change any key combinations to output greek letters in any way you find most convenient. Ukelele will create keyboard layout bundle that you can later share, reuse, move to another computer, and so on. Ukelele is not keyboard remapper, these bundles are usable without any dependencies on vanilla OS X. Another option in Word is to insert an equation - most useful if your alpha is accompanied by other math. ⌘ + ctrl + space opens the emoji viewer; from there you can search for alpha and enter it into your document easily. It will also appear in your recent emojis so you won't have to search for it next time. This is what I figured out reading this article, similarly frustrated by the lack of a "alt-based" alpha option. What are the differences between the various Mac video “compressor types”? What determines whether 'Warranty' appears in About This Mac? I'm about to sell my Mac. What should I delete? What is the request to “Confirm Mac Password” about?